A member of the Jedi Council, Plo Koon is humanoid who's family was strong in the force. Plo Koon had a long history with Qui-Gon Jinn. Koon hoped to have his friend join the Jedi Council, but Jinn's maverick like views kept him from being allowed in. Koon was a Kel Dor, originally from Dorin. He had to wear protective goggles and a antiox mask whenever he was in oxygen-rich environments. Like all Dorins, Koon naturally had highly developed extrasensory organs that adds to his Jedi attributes. Koon was very martial, for a Jedi. Kel Dor natives are known for viewing moral issues in "black and white," making it seem obvious what is right and wrong. Koon took decisive action with little controversy. This helped him significantly during the Stark Hyperspace Wars, when he took up the Republic banner following the death of a great Jedi Master. He took the troops to an unlikely and stunning victory. 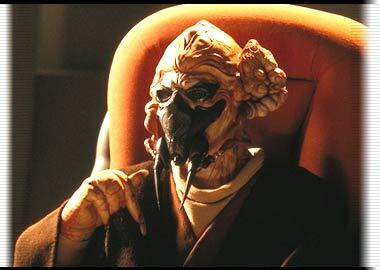 As Plo Koon served in the Jedi Council, he helped them solve their conflicts and problems. He was present when Anakin Skywalker was brought before the council by Qui-Gon Jinn, requesting the boy to begin jedi training. Koon was also on the Jedi Council ten years later, when Mace Windu led two hundred jedi into battle in the Battle of Geonosis. Plo Koon fought with them, and was one of the few jedi survivors of the Battle of Geonosis.